← They’re Coming to Take Me Away, Ha-Haaa! I can’t believe someone pays for this content. Lifelong Westviewian fixture Funky suddenly doesn’t remember his legendary band teacher (and infamous local legend) Harry L. Dinkle, Holly is talking to Funky like he’s new in town and the Alzheimer’s patient is as sharp and quick-witted as ever. He retconned the entire strip just for the sake of re-telling that dumb Rose Bowl parade story, apparently just because he associates the new year holiday with the Tournament Of Roses parade, I guess. Then, after turning his characters into total imbeciles in order to shoehorn his dumb reference into the strip, he can’t figure out how to end it without resorting to pathetic filler, brainless repetition and a “hilarious old coot” gag on top. What a sorry display. 8 days of this drivel later…. That profile of ol’ Mort looks like it was drawn by “Mad’s Maddest Artist” Don Martin! 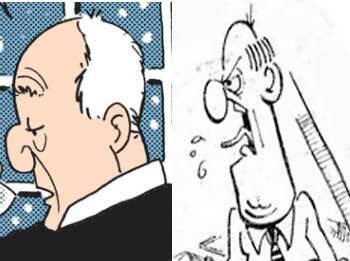 I pointed out on Wednesday’s strip that the characters have been having the bridges of their noses slowly rising over the last ten years, but Mort’s the first one where the bridge is higher than where his nose emerges from his face. He must catch a huge amount of dirt on that trench up there. Of course Don Martin’s stuff was funny and creative, unlike the crap Batty has been putting out. I’ll be honest if it wasn’t for my fellow snarkers here I would have given up on this drek long ago. This right here is the crappiness of this current strip in a nutshell. Instead of, like, actually showing Dinkle do something goofy and whacky we just get people reminiscing about a time when he did something goofy and whacky. Just like how we never actually saw anything of what makes Starbuck Jones so amazing. Or never saw a single sentence of Les’s stupid books. I honestly can’t think even Batiuk thinks these are quality strips anymore. It’s even worse…they’re talking about how they can’t believe an old story about Dinkle, an old story that never even happened! And bear in mind this is only Friday’s strip, he still has another day to go. Like I pointed out yesterday, he didn’t need to invent a new fake old zany Dinkle story, he was already in the middle of a new zany Dinkle story. And not only was it a really stupid new fake old Dinkle story, it wasn’t even substantial enough to fill out the week without resorting to some truly desperate and pathetic padding. He has TWO premises going here, he repeats one of them IN FULL (in a one-panel strip no less) and it still goes absolutely nowhere. Another stellar effort by the master. He can’t even remember that she used to do that stupid thing with the flaming baton. Sad. Which she just reprised in a Sunday strip last year in Cleveland to show a Starbuck Jones extra how to handle some kind of flaming weapon. Wait, what was the band director’s name? Harvey Dalrymple or something like that. I wish Batiuk would remind us. I am beginning to suspect Batuik is trolling us. Since we’re the only people still paying attention on a daily basis. That thought has crossed my mind too. Quite possible, though I would say that this “tell, don’t show” mentality had become a hallmark of TB’s strips before he became aware of this site (or before the cease & desist letter anyways). I’ve become accustomed to stories moving at a snail’s pace — Like Duuuhhhren taking 8 months to open an envelope. In that case, at least, Batty thinks he’s building suspense. But TRIPLE dipping on something as dumb as “we marched backward AND played music backward” takes BatWit to a whole new level of hackery. three days of ‘marching backwards” ‘really you marched backwards” “yes we marched backwards” on endless repeat is enough to drive one to madness. Also one finds it rather weird that after an episode where Harry really was a fifth wheel (he didn’t raise the money or book the studio all he did was drive) we are given this endless recounting of Harry Dinkle’s greatest hit (which didn’t happen). And the Author’s show don’t tell style is painfully apparent in this arc -really it’s a comic strip you could draw what is being talked about its not like you’d have to hire a band or something.